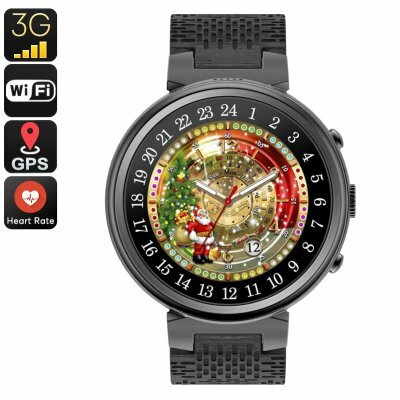 Successfully Added IQI I6 Smart Watch Phone - 1 IMEI, Android OS, 2MP Camera, Touch Screen, Bluetooth, WiFi, 3G, GPS (Black) to your Shopping Cart. With its Android operating system and SIM card support, the IQI I6 smart watch phone is so much more than your regular Bluetooth watch. Supporting one IMEI number and a SIM card slot, this phone watch allows you to enjoy all regular smartphone features from your wrist. From now on, you’ll never again have to worry about bringing along your cell phone as this smart watch lets you make calls, send messages, and browse the web at any time. It even supports Google Play thanks to which you can download the latest Applications and entertainment to be enjoyed on the watch’s 1.3-Inch display. A powerful 400mAh battery brings days’ worth of standby time and up to 4 hours of continuous usage time. This means that you’ll be able to use your watch phone throughout the day without needing to worry about running out of juice. With 16GB internal storage, it offers enough memory to store your contacts, media, and pictures. The latter can be snapped with the phone watch itself as it features an intergraded 2MP camera. WiFi support and 3G connectivity let you browse the web wherever you go. This allows you to check the social media updates of your friends even when you’re not at home. With its Quad-Core CPU and 2GB RAM, this smart watch phone handles all the basic Android features out there. It furthermore treats you to an accurate GPS and pedometer that tracks your daily activity levels. Naturally, it can also be paired with your regular smartphone through Bluetooth. This allows you to use your watch phone without the need of inserting a SIM.